It’s a beautiful morning on the southwestern Indian Ocean. If we were ashore, this would be a beach day. Right now the wind is light and variable. But that’s supposed to change tonight. The wind is predicted to swing into the northeast (remember, wind is designated by the direction from which it blows) and build to about 30 knots. The Agulhas Current flows generally southwest, so a northeast wind blows with the current, accelerating its speed (drift in nautical lingo). However, by early morning tomorrow, the wind is to shift to the southwest and build above 30 knots, about 54 kilometers per hour. This is not good. If that happens, then the stiff wind will blow against the current. Anyway, while things are quiet, let me take you on a tour of the ship and introduce her people. The traditional shipboard realms of responsibility go back to sailing ship days with some distinctly modern variations. Knorr, operated by the Woods Hole Oceanographic Institution (WHOI) and owned by the U.S. Navy, exists to serve science. 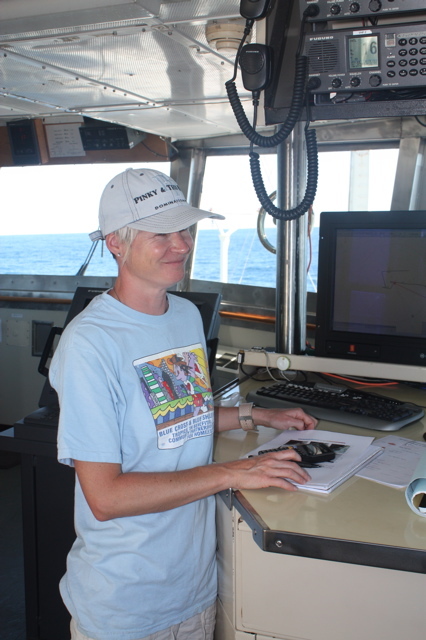 Lisa, the Chief Scientist, determines where the ship goes and what she does; this is Lisa’s cruise. But the ultimate responsibility for everything lies with Captain Kent. This is his ship. Captain Kent has three mates: Chief Mate Dee, Second Mate Derek, and Third Mate Bree, and one of them is on the bridge actually operating the ship 24 hours a day. The captain stands no fixed watch, but “floats” between them as he sees fit. Traditionally, the chief mate assumes command of the ship in the absence or disability of the captain. On a day-to-day basis, Dee is responsible for the deck, including the mooring and other operations on this cruise. She plans and supervises on-going maintenance of all machinery, winches, cranes, capstans, anchors, and other gear, everything “outside.” All ships require constant maintenance, but especially Knorr, an old ship that travels to the ends of the Earth in all seasons and weathers. Second Mate Derek, according to venerable tradition, is the navigation officer. 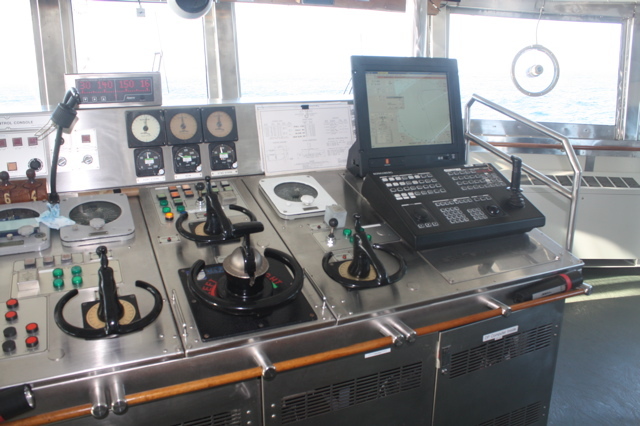 He assures that all pertinent charts and nautical publications are aboard for this cruise and those to follow. But his most important duty is to plot a safe course for the ship in all oceans of the world. Third Mate Bree is responsible for all safety equipment, including lifeboats, rafts, life jackets and immersion suits (there are two of each every cabin) and all fire-fighting equipment. These duties for each mate are in addition to their prime job—the safe and professional operation of the ship. If the bridge is Knorr’s brain, the engines are her muscles. 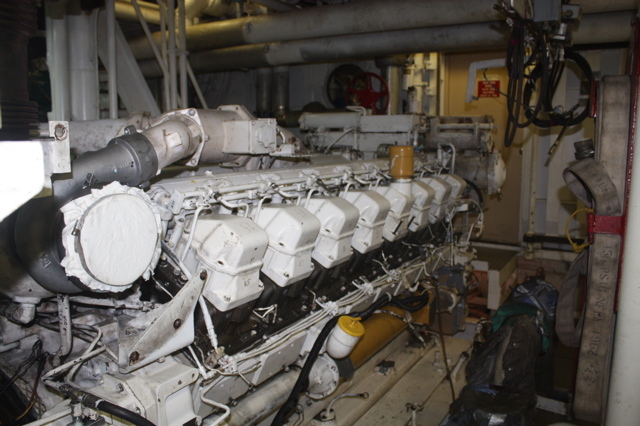 There are four Caterpillar Diesel engines, three with 16 cylinders, each generating 1,500 horsepower, and one eight-cylinder engine, sometimes called “three cats and a kitten.” Knorr has a range of about 10,000 miles at her cruising speed of eleven knots, burning 3,500 gallons of fuel a day. Steve is chief engineer. He has three assistant engineers, Piotr, Wayne, and Sasha, first, second, and third, respectively, who stand fixed eight-hour watches seven days a week. 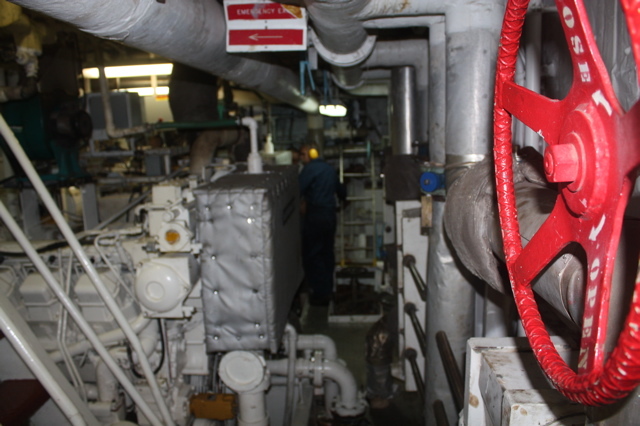 The engine room staff is also responsible for the electrical generator and the water maker. We use for all purposes about 2,000 gallons of fresh water a day. Clearly, we couldn’t do that if the ship weren’t desalinating seawater, and we wouldn’t be of such good odor. Last year I sailed on this ship with a different chief engineer, and passing him in the galley, I asked, how’s it going? He said, “Well, the lights are still on.” I laughed, but then thought about it. Yeah, I take for granted when I flip the light switch in my cabin that the lights will come on. We all know that somewhere below there is an engine room, but it takes a visit to actually see the intricacy and complexity of the machinery—and hear the ear-splitting noise—to appreciate the work these people do, without which we’d be dead in the water. 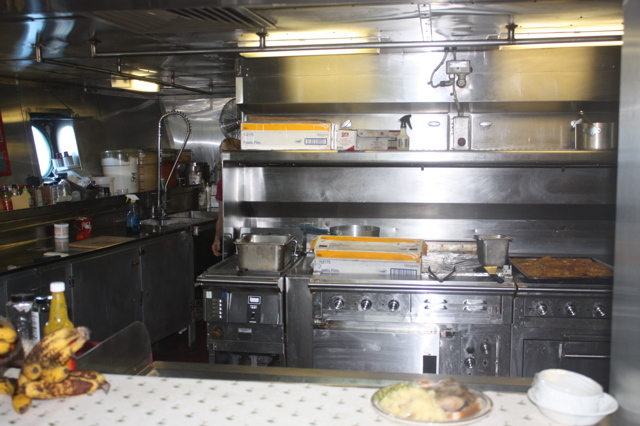 The “mess” is ancient nautical language for the dining room, and “galley” is the kitchen. Steward Bobbie, who’s been cooking at sea for 30 years, the last ten on research vessels, runs the galley; and in port, she buys all the provisions, which come by the truckload. (She’s also responsible for all the housekeeping items, bedding, towels and such, as if Knorr were a hotel, which in a sense she is.) Eric is Cook, and Tony is Messman. They produce three excellent hot meals for 36 of us every single day, including fresh-baked bread, muffins, cakes, and pies. And very day so far, one of us in the science staff has said, “I can’t believe how much I’m eating. I never eat like this ashore.” We’re used to it now; we’ve almost stopped saying that. In a centuries-old tradition, the bosun (short for “boatswain,” an antique word almost never used today) actually performs the deck work. Anything that needs doing on deck, including loading and securing the heavy gear that comes aboard on every trip is done by the bosun. The bosun supervises and instructs the “able bodied” and “ordinary” seamen who work for him, those terms indicating levels of experience. Kyle, the scheduled bosun, was taken to the hospital in Cape Town with back problems the night before we left. Kyle’s a hard worker who can do anything from welding to splicing wire, and he hated to be left behind. Bill, a capable and experienced man, has taken over for this trip. Dr. Lisa’s cruise is one of many Knorr will accommodate this year. When our cruise is complete, the ship will drop us back in Cape Town and then depart for Barbados, where she and the crew will pick up another science staff doing entirely different work, then pick up another in some port and so on. 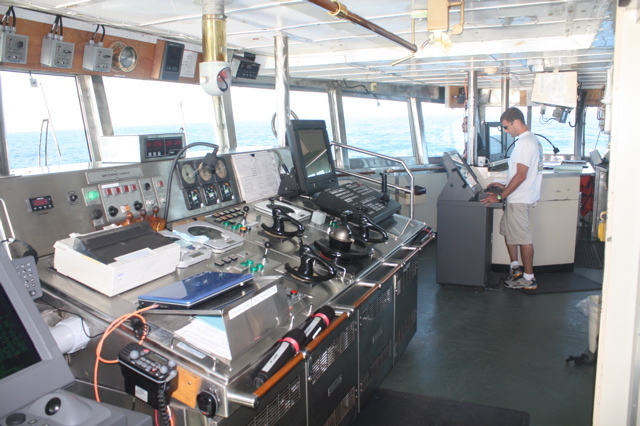 Each chief scientist brings his/her staff and equipment aboard. Lisa has brought mooring technicians, led by Mark and Robert, all the attendant gear necessary to perform mooring and other oceanographic operations, as well as students from the University of Miami, the University of Cape Town, University of the SW Cape, Nelson Mandela Metropolitan University, and a technical team from the Scripps Institution of Oceanography. None of these people is part of Knorr’s permanent staff. 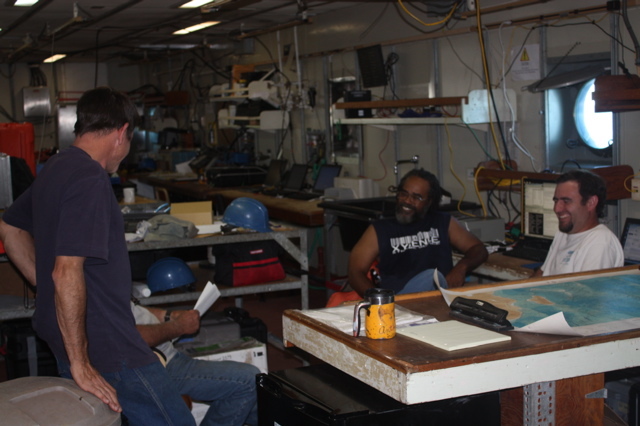 However, because so many different science parties come aboard, Knorr keeps a Shipboard Science Support Group (SSSG) whose job it is to maintain and operate a range of electronic and mechanical equipment that remains permanently on the ship. Amy and Anton are our SSSGs. That about covers our ship aloft and alow, as they used to say in the sailing-ship days, fine, competent, and congenial people one and all. It’s early evening now. The wind is holding steady at a moderate 26 knots. We’ll see how it develops through the night. We really don’t have much choice except to get seaward of the continental shelf where typically waves are the worst.